Fans of the Unikitty™! TV series will love the 41775 Unikitty™! Collectibles Series 1—a fun and colorful lineup of exclusive, limited edition buildable figures. In Series 1, each Unikitty™ or Prince Puppycorn™ figure comes in a sealed ‘mystery’ bag with a collector's leaflet and a cloud display plate, and adds exciting new play possibilities to LEGO® Unikitty™! construction sets. There are 12 to collect in all! 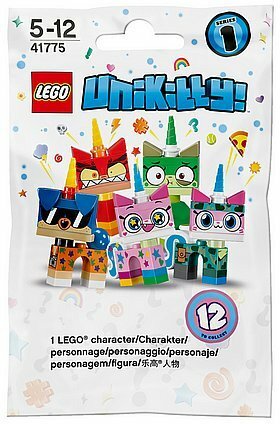 12 collectible Limited Edition LEGO® Unikitty™! figures to build and play out favorite scenes from the TV series or make happy, colorful stories of your own! Combine with LEGO® Unikitty™! building sets for endless play possibilities. Have fun trading your figures with your friends to complete your collection. PLEASE NOTE: Each mystery bag contains one of the 12 buildable figures available in this collection. Unfortunately, we cannot accommodate requests for specific figures. If you purchase more than one mystery bag, you may receive two or more identical figures. Due to the nature of the product we will not be accepting returns or refunds even on unopened packs.